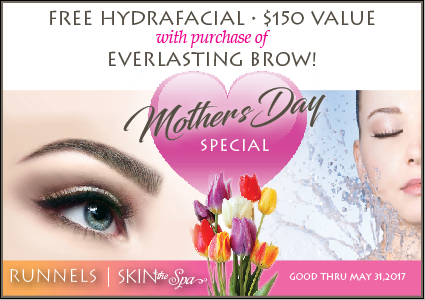 Schedule your Everlasting Brows microblading appointment and receive a FREE HydraFacial MD*! What an amazing deal! $150 value • This offer is only good through May 31st, 2017, so schedule your appointment today! Want to know more about Everlasting Brows? Check out our post here. For more on HydraFacial, Hollywood's favorite facial treatment, click here. *HydraFacial MD session must be performed on same day and time as Everlasting Brows microblading session. When it comes to your face, trust the artistry and expertise of SKIN the Spa at Runnels Center: 601-939-9778.